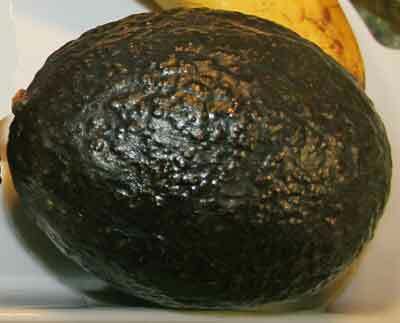 Do you ever look at the avocados at the grocery store and think - cake? Neither do I, but somehow I got on the newsletter list for the California Avocado Council (their job is to promote California avocados by developing recipes). Occasionally I try one of their recipes and this one just sounded so strange that it had to be good. Here's their recipe, but of course I can't follow a recipe exactly and always wind up tinkering with it as I go. Here's my revised recipe (I added coconut and pecans and an extra egg). It's actually more like banana bread than it is cake. 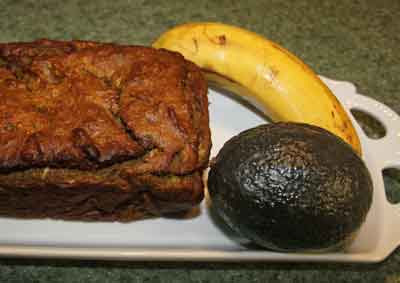 Bananas and avocado makes a moist loaf. Line a 9 x 5 x 3 inch loaf pan with nonstick foil and lightly grease the bottom. Combine dry ingredients (except for coconut), mixing and set aside. Scoop the avocado into the food processor or mixing bowl. Add the bananas, oil and brown sugar and blend until light and creamy. Add the dry ingredients, mixing well, then add one egg at a time, mixing after each one. Mix in the nuts and coconut and pour into prepared loaf pan. Bake for 1 hour and 10 minutes, or until a knife inserted comes out clean. 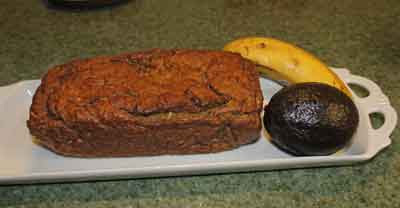 This makes a very moist bread, good with cream cheese or as a low-calorie dessert or snack. 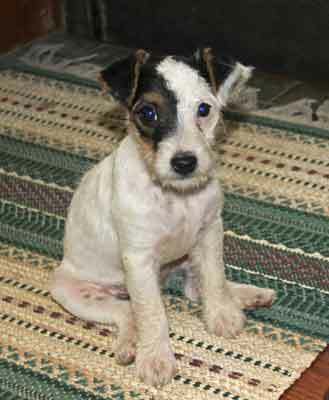 And for all who asked if the new puppy has a name yet, she is now Cricket. Molly is adjusting pretty well, mostly ignoring the new puppy. 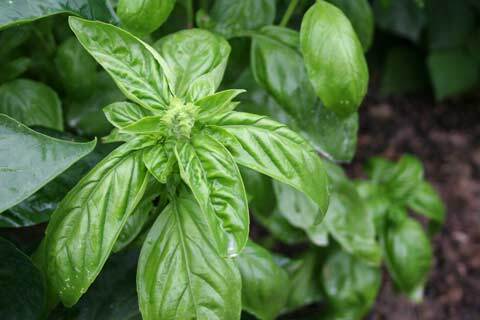 As the late summer days shorten and night temperatures cool, basil plants slow their growth. If you've kept your plants clipped back all summer, keeping them from going into flowering, then you likely have more basil than you can use. It's a good time to freeze some pesto for use during the winter. Culinary herb bed where I grow 12 different varieties of basil. It doesn't really matter which kinds of basil you use for pesto. 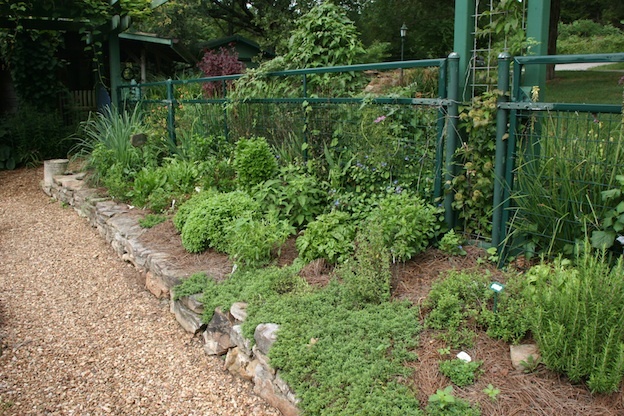 I usually mix more than one variety, like sweet basil and lemon basil. Or Greek columnar and Thai basils. Purists use only sweet basil, but the important thing is to use whichever basil you have. Here's my recipe for freezing pesto. Put everything into the food processor and blend ingredients until smooth. Scrape the edges to make sure everything has been processed. Pour the mixture into ice cube trays, filling each section. Freeze for 24 hours, then pop out the cubes into Zip-Lock bags and keep frozen. Now the trick. When you are ready to use pesto, combine it with half Romano, half Parmesan cheese, freshly grated if possible. Since those cheeses don't freeze well, the flavor of your pesto will stay much fresher if you don't put the cheese in the pesto before freezing. 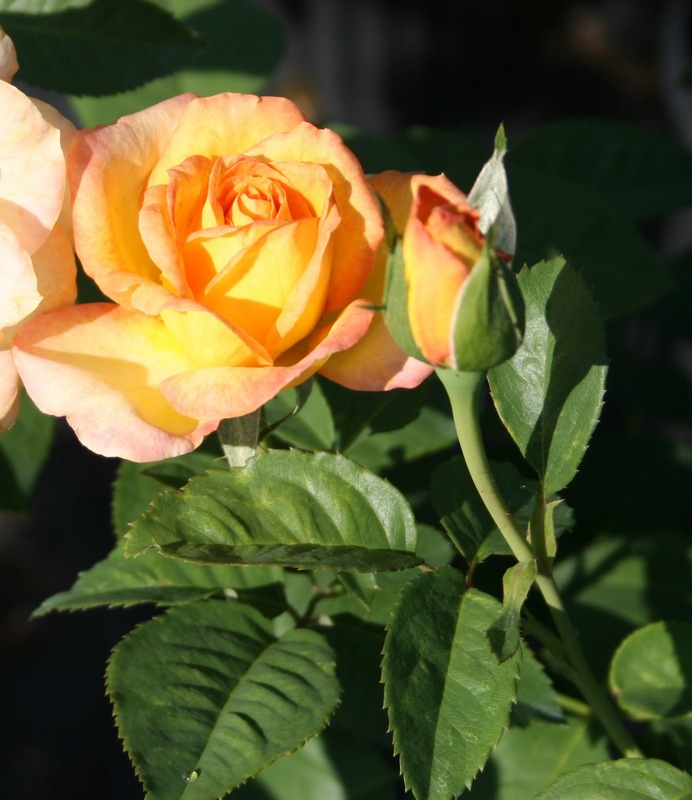 The end of summer also means the roses are blooming vigorously. This pesto doesn't freeze as well as plain basil pesto, but use it on fresh-cooked tortellini with a few shrimp or mushrooms added. Roses and basil taste great together! Peel and coarsely chop garlic, then add rose petals, basil, nuts and olive oil in food processor. Pulse blend until everything is well pulverized. Add remaining ingredients and mix well. This can be stored for up to 4 days in the refrigerator. *If you aren't sure what roses you can use, visit my YouTube video for tips on using roses in food. Thai basil, in need of having the flowering spikes removed. The other crop from the garden in excess this time of year are zucchinis. Here's a way to use up more basil with zucchinis to make zucchini pesto bread. 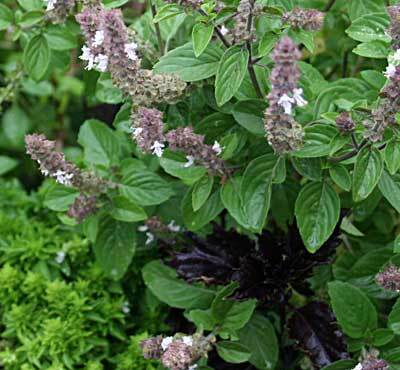 Thai basil is good in this, but so is lemon basil or any kind you have on hand. Preheat the oven to 350 degrees F. Grease a 9 by 5 by 3-inch loaf pan with butter. Combine the eggs, ricotta, pesto, and 4 tablespoons of the melted butter in a mixing bowl, mixing well. In a separate mixing bowl, combine the flour, baking powder, and salt, and stir to combine. Add the grated zucchini to the flour mixture and stir to coat the zucchini. Combine the flour-zucchini mixture to the egg-cheese-pesto concoction, and mix well. This will be a fairly thick mixture so be sure to stir it together well. Transfer the dough to the loaf pan and top with the remaining 4 tablespoons of melted butter. Bake until a toothpick inserted into the middle of the loaf comes out clean, about 55 minutes to 1 hour. Cool the bread in the loaf pan on a cooling rack for about 10 minutes before removing the loaf from the pan. The Zucchini Pesto Bread can be sliced and used for grilled Provolone cheese sandwiches, or for any kind of sandwich bread. Top slices with very thin slices of tomatoes and grated Parmesan cheese toast under the broiler. This bread also freezes well. Great sculpture of Green Man, the ancient gardener image. Like I promised in the last blog post, I've been away at the 2nd annual National Heirloom Exposition in Santa Rosa, California. It was even better than last year in many ways. Over 100 national and international speakers (including me) but more importantly, many of the long time movers and shakers in the organic, local foods movements. 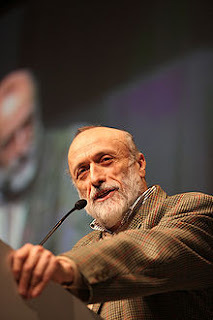 One speaker, who I didn't get to hear, was Carlo Petrini, the founder of Slow Foods International. He is passionate about encouraging local farmers to produce food for the local market. I'd heard him speak when I was at the first Terra Madre conference in Turin, Italy in 2005. Actually I didn't get to hear any of the speakers besides my own program. This year I had to do the entire festival by myself. Finding farm sitters for a week is difficult, so Josh had to stay home and tend the goats, chickens and other farm details. 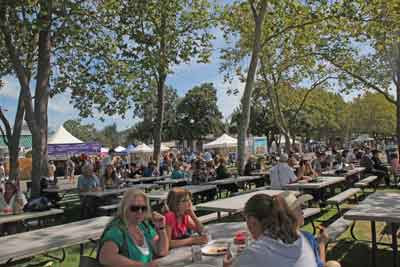 Each of the 3 days of the Expo I left for Santa Rosa at 6:30 a.m., drove for an hour in backed-up traffic (think 3 car lengths for every 5 minutes). I'd restock the booth with books and Nail Fungus Soak, then would be at the booth until 9:00 p.m. and head back to American Canyon where I was staying with friends, Eddie and Greg. That's a lot of time standing on concrete! By the end of it, my throat had given out from talking to customers all day, my feet hurt and I was ready for it to be over. Some of the folks from Baker Creek Seed gave me a break so I could walk around for about 20 minutes and take some photos. That's all I got to see of the event. Here are some views for you. It was truly amazing, with about 14,000 people attending. View from my booth in one of the buildings. 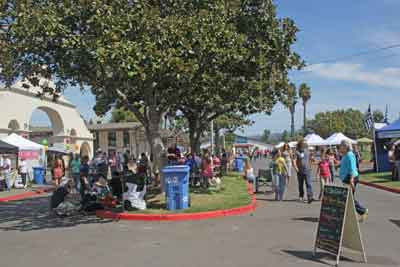 The Expo is held at the Santa Rosa Fairgrounds. If you've ever been to a State Fair somewhere, it was that big, just without the carnival. Early in the day, plant markets on the right, more markets on the left. The Fly by Night band. 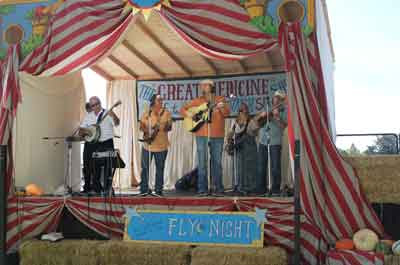 There were 3 performance stages on the grounds, with musical groups playing continuously throughout the day. 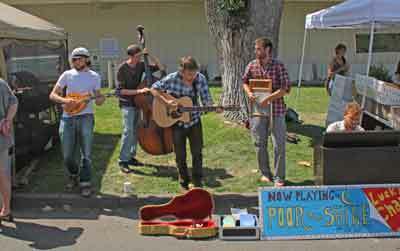 In addition, there were numerous other groups that set up spontaneously under shade trees and played for a few hours. The music was good, the variety excellent. Lots of music on every corner. There was an amazing amount of things for kids to do. Many area high schools and junior high kids had made displays and there were about 40 or 50 groups and exhibits of those. 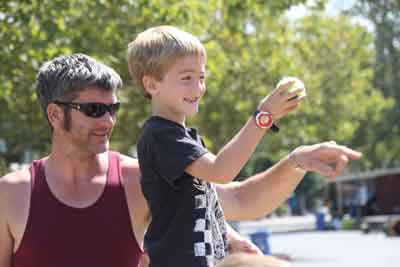 One day of the Expo was Kids Day and all day long school buses were driving up and unloading hundreds of kids. That was the best day because the kids were so excited and found so much to learn about. One tiny section of the rows and rows of school garden displays. 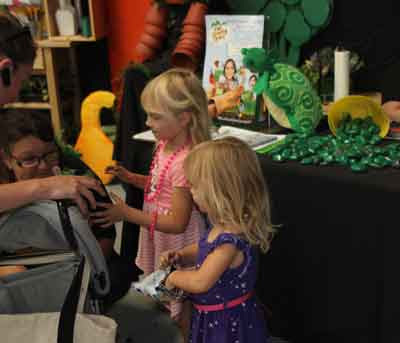 Kids of all ages found lots of activities aimed specifically at them. 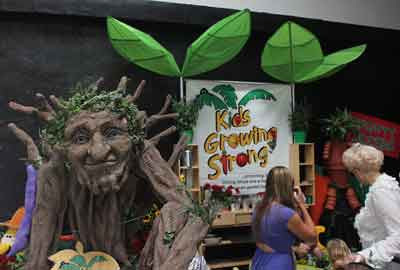 There were heirloom breed animal displays, animal petting areas for kids, even a "Dunk Monsanto Man" booth where kids (and adults) could try to knock Monsanto Man into the water. It was publicity for the Proposition 37 that California is voting on this November, which provides guidelines for food producers to list all of the ingredients on packaging, including whether ingredients include Genetically Modified Organisms. 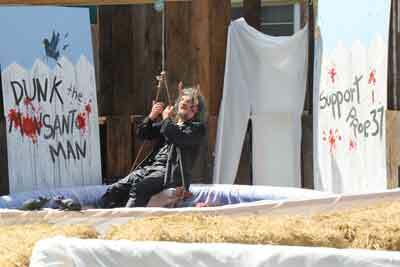 Monsanto Man gets dunked was a popular attraction. Kid pitching at Monsanto Man. 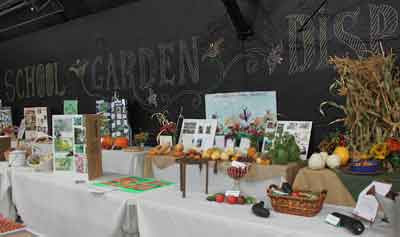 But the really, really big attraction was the Great Hall where all of the heirloom varieties were displayed. One tiny corner of the Great Hall. 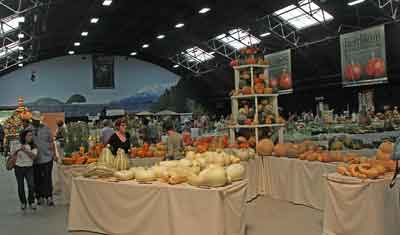 This is just a portion of the squash displays. 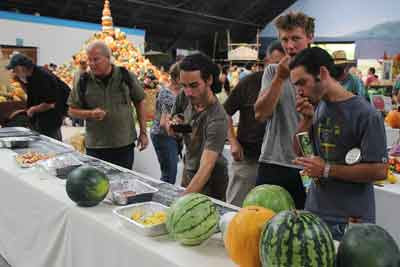 Heirloom watermelon tastings were popular. Every day there were watermelon tastings, tomato tastings, and more. Notice in the left, background of the photo above. That is a giant display of just heirloom squash varieties in a little mountain! Lots of shady picnic areas are scattered about the grounds, each with musicians playing. Just a few of the hundred or so heirloom tomato varieties. 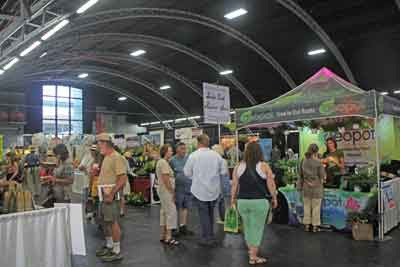 There were about a dozen seed companies with booths, lots of garden tools, garden art, wooden chicken coops for sale and such a wide variety of food available in the food courts that I actually lost count. Everything from Indian, Thai, Southern Soul food, barbecue, vegan, vegetarian, organic beef, locally made ice cream, French crepes, organic shakes, and much, much more. Overall it was a fantastic Expo. I shouldn't have done it by myself, I won't try it again, but I'm glad I was there. I wish all of you could have been there, too! 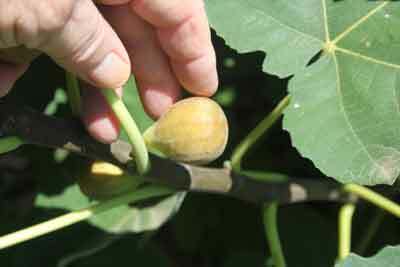 Figs are not a crop many gardeners think of in our part of the country (the Ozarks Mountains of Missouri/Arkansas). Probably 34 years ago when I moved here, and we were still solidly in Zone 6, figs wouldn't have survived. Over that time, we've slipped into Zone 7-a as the climate has changed. Like most gardeners, I like to try to grow things I supposedly can't. As a long time fan of figs, I started my first fig plants in the 1980s just to see if I could grow them. Brunswick figs ripening on the stem. 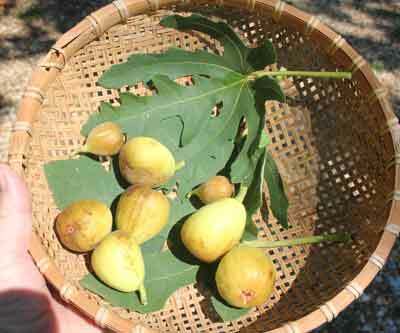 You may or may not know that figs can't be picked early, like peaches, then left to ripen. 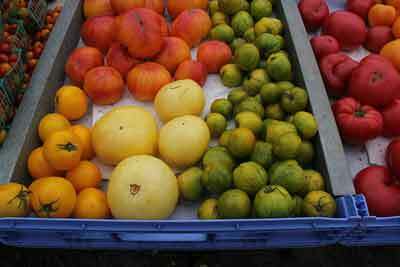 They have to be picked when they are completely ripe. That means soft, ripe figs don't ship well as they only have about 3 days of freshness before they start to get mushy. I don't do anything special for any of my figs. I used to mulch them heavily, wrap leaves and straw around the stems, but the efforts were, well, fruitless. Brunswick is a fig that in our climate dies to the ground each winter, no matter what you do. And each year it sends up new stems and the figs begin ripening in late August. 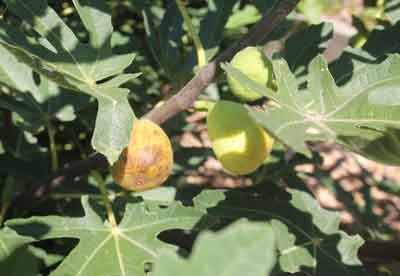 Constantine figs ripen throughout the summer and fall. The next fig I added was Constantine. This is a large bush fig (most figs are substantial bushes or small trees). Mine reached about 12 tall. I had to move it, and had a back hoe dig it up and put it in a new, better location. This year, its first year in the new spot, it has grown to over 8 feet tall and has produced a small but good crop of figs. 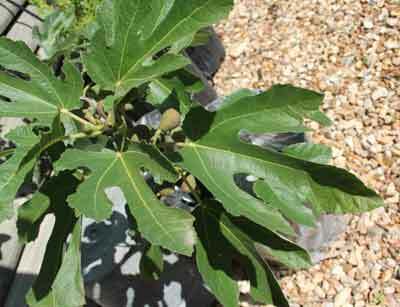 You can tell the variety of fig by its leaf. 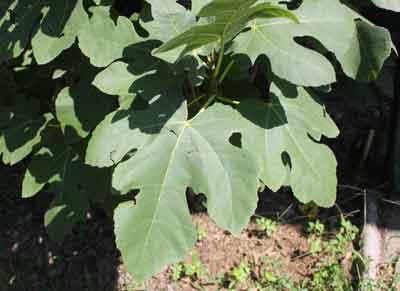 Each kind of fig has its own distinctive leaf. If you look close, you can see the difference in the one above, and the Brunswick below. 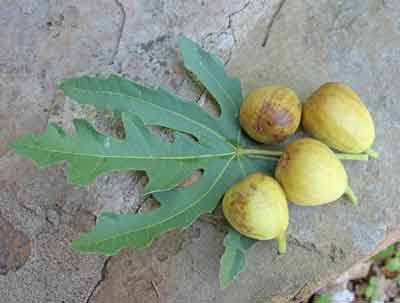 The leaves are the same size, but the size of the figs on Brunswick are much larger than on the Constantine plant. Brunswick ripe figs and leaf. 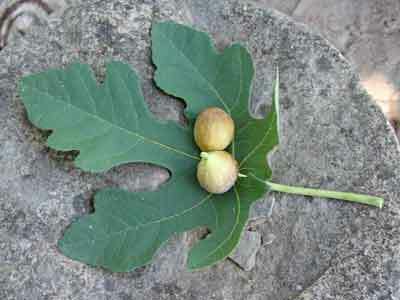 I'm also growing Brown Turkey fig but the few figs it had were gobbled up by a squirrel before I got to them. Brown Turkey figs aren't as tasty as the others, above. Friends at Bear Creek Farm gave me a pair of Chicago Hardy fig plants and they've been producing figs even while still in the pots! Their figs are small like Constantine, but sweet and produce bountiful crops. 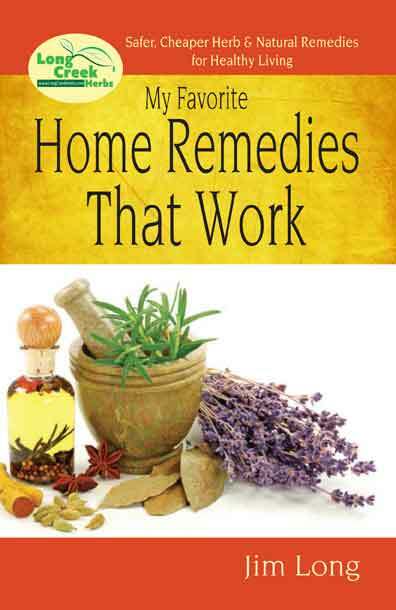 I have a new book just out. If you follow the link you'll see more details. Customers have been asking for this title for several years so I finally got it off my desk and published. If you are anywhere in the vicinity of the National Heirloom Exposition in Santa Rosa, CA, come by my booth and say hi, or come to my program. The Expo runs from Sep 11 - 13 at the Santa Rosa Fairgrounds. See you back here in a week. Just a few of the pepper varieties I'm growing. If you've been a follower of my blogs for very long you know I have a great love for peppers. 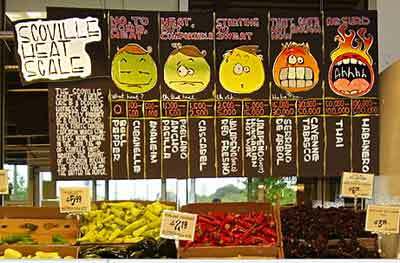 In Pepperspeak, I'm a "pepperhead," meaning I like most everything peppery. Fresh, dried, pickled, sauced, fried, roasted, I like them all. Bhut Jalokia, or Ghost Peppers. For about the last 5 years if you did a Google search for the words, Bhut Jalokia pepper, you would find my blog posts at the top of the search. Now that more people are growing and writing about what was, until 2 years ago, the world's hottest pepper, rated at 1 million to 1,200,000 Scoville Heat Units. 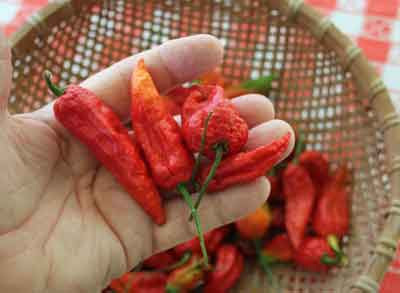 But that world record now goes to the Trinidad Moruga Scorpion, which weighs in (in heat) at 1,200,000 to 2,000,000 heat units. Pepper drying at our house is a regular occurrence in the fall months. 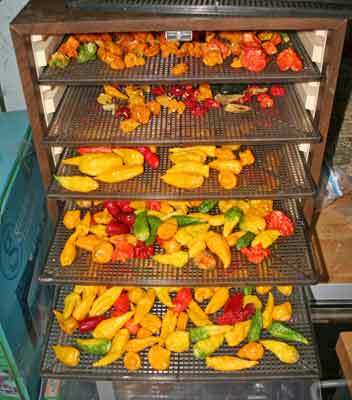 I annually grow around 25-30 varieties of hot peppers and use most of them dried, the varieties mixed together and crumbled for winter seasoning. 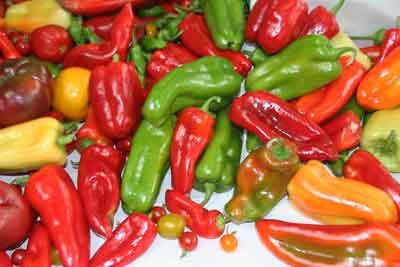 Some of the sweeter varieties such as Poblano, I roast and freeze. I'm working on a new book on hot sauces and so this month I'm cooking up some new ways to use my peppers. Hot sauce is easy to make at home and you can can, refrigerate or freeze what you make. The basic recipe I'm starting with is easy for anyone who wants to make hot sauce. You can vary it according to the kinds of peppers you have on hand, and the amount of heat you want. For example, if you like virtually no heat, your sauce could contain Poblano, Ancho or Pasilla peppers, rated at 1,000 to 1,500 H.U. If you want a little heat, add Cascabel (1,500-2,500 Heat Units). Jalapenos and Hungarian Hot Wax will give you 5,000 - 15,000 Heat Units. Cayenne peppers rate at about 30,000 H.U. and Habanero peppers are about 50,000 - 70,000 depending on where they are grown. You can mix and match in the following recipe. Just remember, you can always ADD heat, but once the sauce is made, you can't remove it. You can vary the kind of vinegar or lime juice you use, but don't leave it out because that's what preserves it. Your sauce should contain something acidic, like vinegar, to make up about 20% of the sauce. White wine vinegar, distilled white, apple cider vinegar, rice wine vinegar, all can be used. 2 - Coat a medium saucepan with 1-2 tablespoons vegetable oil and empty the contents of the food processor into it. Saute the mixture in the skilled for 5 to 7 minutes, stirring occasionally. 3 - Add 1 cup water and 1 cup of your favorite vinegar and continue cooking for 20 minutes. Add 1/2 teaspoon salt while mixture cooks. 4 - Remove from heat and let cool to room temperature. Pour the mixture into a blender (not the food processor) and blend for 4-5 minutes on high speed, or until everything is completely pulverized. The sauce will thicken slightly once it's in the refrigerator, so if it seems too thick coming out of the blender, add another 1/4 or 1/2 cup vinegar to thin (don't use water, remember, the acidity is what preserves this. Your hot sauce is now ready for putting into jars and keeping in the refrigerator. This will keep for 2-3 months refrigerated. You can also freeze some of it in ice cube trays, then once frozen put in plastic bags in the freezer for later.